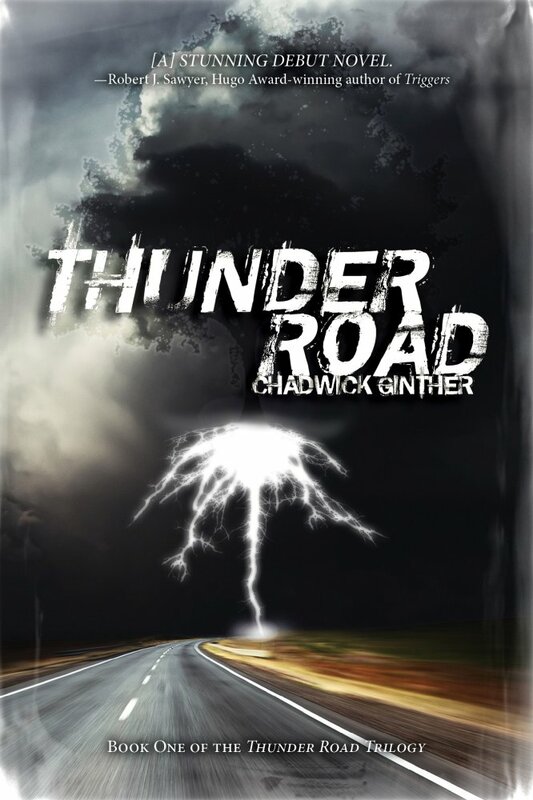 Had I not known that this was his debut novel, I would have thought that Chadwick Ginther’s Thunder Road was written by an experienced novelist. His characters were well developed, his plot strong and thought provoking. After reading the first two chapters, I flipped back to the front of the book and said “thank goodness” as I read “Book One of the Thunder Road Trilogy”. I can look forward to two more books in this world that Ginther has created. As an occasional scholar of Norse literature, I am always worried when a modern author tries to tackle Norse material, but Ginther was able to demonstrate a firm and diverse knowledge of Norse cosmologies and the complex issues of Norse literature and bring them into a Canadian context. He demonstrated advanced knowledge of Norse myths and the issues that underlie many Norse tales and was able to create his own story without feeling the need that authors often do to re-write myths in order to fit them into their book’s plot. Instead, Ginther creates his own plot that seamlessly integrates elements of Norse folklore and makes it seem like a Norse context is comfortable and familiar for any Canadian reader. His book also includes a quick guide at the end for any reader who needs a reminder of an element of Norse myth. This story is essentially one of blendings, mixings, and integrations. His plot combines the superhero narrative with the mythically modern. Chadwick Ginther’s hero Ted begins as a worker at the Alberta oil sands and this ecological travesty releases Surtur, the Norse fire giant and destructive force, into the world. Ted’s exposure to the supernatural makes him a marked man, perpetually tainted by the otherworldly and therefore of interest to the various mythical beings inhabiting our world. This taint is then bodily written upon him as dwarves capture him and tattoo supernatural symbols over his body in gold and metallic blue ink. He is literally inscribed with the supernatural and his body is infused with the otherworldly. He becomes a connection between the human world and the mythic, uncomfortably trapped between them, suspended between the past, present, and future. It is not surprising that, as a link between the different realms of time, he comes into contact with the Norns, the mistresses of fate who can see past, present, and future and have their own agenda for shaping a new world. Trapped between the old mythic world of the past and the new industrial, hypermodern world, Ted embodies the classical Canadian coming of age story – trying to define oneself in a new life elsewhere while carrying the baggage and responsibilities of the past. His new lover in the novel, the youngest of the Norns, Tilda (herself a symbol of the requirements of the past and the desire to make her own future) sharpens this conflict between past family responsibilities and the need to create oneself anew elsewhere. Chadwick Ginther illustrates in his novel that the coming of age narrative is not one limited to the arbitrary barrier between youth and adulthood we have created, but is rather a continual process – perpetually coming to ourselves in a new identity while struggling with past visions of ourselves, and midlife Ted as well as young Tilda can both equally engage in this process of self discovery and struggling to come to terms with change. Ginther plays with ambiguities in his novel, raising questions about notions of nostalgia for the past, ideas of progress, the limits of knowledge, and ideas of trust, and this is most embodied in the figure of Loki who is the physical representation of the ambiguous. Loki, the major trickster figure of the Norse cosmology has the ability to shift shapes, to change and alter himself, showing that gender, shape, form, and even humanity is variable, changing, and subject to question. He is like a walking question mark in this novel, always opening things to speculation and causing the reader to re-assess their ideas. Ginther handled the figure of Loki (one that is notoriously difficult for the modern audience with their binary notions of good-evil, male-female, trustworthy-liar to grasp) extremely well and although I enjoyed the superheroic character Ted, my favorite character in this story was Loki, who represented Chadwick Ginther’s playful side and desire to question everything and bring his audience on a speculative ride into new territories of the mind. In Thunder Road, Chadwick Ginther opens a doorway to the mythical in the modern world, letting his reader almost believe that at the edges of our reality, in the most mundane of places, there lurks the remnants and lingering presence of the Otherworld. Like the character Ted, written on and inscribed forever by dwarvish ink, the reader is forever marked by their encounter with the supernatural. Nancy Kilpatrick never makes things easy for her reader or provide them with simple answers. Her creative gift is to teach through her writing and open up questions, complicating the potential answers to remind you that answers themselves are too simple and impossible – answers are the main fantasy in her works. In the short story Berserker, Kilpatrick uses the second person to put you in the position of Dracula himself. It transposes the familiarity of your own body as the reader with the foreignness and otherness that she inscribes on you through the narrative voice – by calling Dracula “you”. Her voice in the narrative insists that you are both human and not human, just as the vampire itself is a figure that straddles the line between ‘us’ and ‘them’, between familiar and strange. She evokes in her reader an intense interest and insight into Dracula’s mental and psychological state. Her narrative voice inserts his voice into your mind like a voice on the shadows of your consciousness whispering thoughts into your head. From this othered normalcy that she creates, Nancy Kilpatrick is able to help the reader to both see and also question their own modernity, their assumptions, their beliefs. She critiques modernity for the need to “know” something by putting it into a category, controlling it. She reminds the reader that this need to control or believe in the illusion of control is born out of fear of things that don’t make sense, things that defy easy categories. But even when critiquing control and ideas about control of the self and other, Kilpatrick doesn’t make “control” an easily definable thing. There is no real escape from control and no simple solution that suggest ‘this is it, now get yourself out of it.’ She portrays Dracula’s encounter with Victorian notions of femininity and the stern and strict controls that are placed on Victorian women. Dracula asserts his vampiric powers over the Victorian woman, seeing his own wild ‘control’ as an escape from social suppression. However, the vampiric does not release women from control, only from social convention. It is not freedom, but another set of chains. Nancy Kilpatrick complicates the very notion of control itself and asks her readers if we are ever really free. Home is a key feature in this narrative. Playing on the idea that the vampire must sleep in his or her own home soil, Kilpatrick creates a vampire who is stranded between his heart’s home that was formative in his creation, his Transylvania, and his new home of England, a controlled place that lacks the wild beauty of his native soil. The land itself is infused with blood and bloodlines, it shapes her characters, pumping itself through their veins. We are all formed by notions of home – it creates us, shapes us, and we will always lay in our own earth, even if we bring it with us riding on our emotions and soul. But even home is unstable and when you go to a new place and taste of their blood, it flows through you. I would like to quickly (re)introduce you to Ian Rogers. 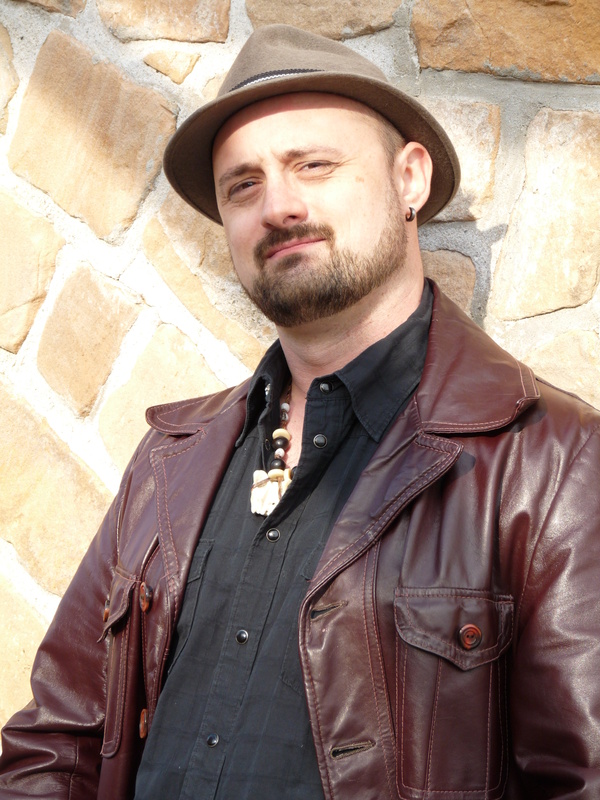 Ian is the author of the Felix Renn series of supernoirturals, and has had his work published in various collections (including Imaginarium 2012 and Strange World) and markets such as Cemetery Dance, On Spec, Broken Pencil, and Supernatural Tales. His collection of Felix Renn stories titled SuperNOIRtural Tales will be published in November, 2012 and his collection of short stories Every House is Haunted is currently available for pre-order. You can read more about Ian Rogers at www.ian-rogers.com and more about the Black Lands at www.theblacklands.com . If you have not yet done so, please feel free to check out my Interview with Ian Rogers on Speculating Canada at https://speculatingcanada.wordpress.com/2012/08/23/interview-with-ian-rogers/ and my reviews of his books by clicking on Ian Rogers in the tags section to your left. I want to thank Mr. Rogers for this exciting revelation into the Black Lands Vampire. When I started writing stories set in the milieu of the Black Lands — a dark dimension filled with supernatural entities that lies next door to our own — I knew that at some point I’d have to write one about vampires. So I decided to write it first. Temporary Monsters is, ostensibly, a story about a designer drug that turns people into monsters. It introduces Felix Renn, a Toronto-based private investigator, his ex-wife/assistant Sandra, and the alternate reality in which they live where the supernatural exists as a matter of course. When I decided to include vampires in my Black Lands bestiary, I knew I wanted to keep things simple. I wasn’t going to introduce a bunch of wacky new features to make my vampires stand out among the rest. Black Lands vampires are vulnerable to… Lucite! Yeah! And they don’t mind sunlight, but they real hate… uh, fog! Yeah, that’s it! A certain young-adult author has already done that, and her vampires are so different from the norm that some readers don’t even consider them to be real vampires. Despite that, I knew that I had to be consistent. I wasn’t just writing stories here, I was building a world, and if I said vampires could be killed by a wooden stake to the heart, then I had to be sure to stick to that from then on. My vampires, which is to say the ones that come from the Black Lands, are fairly standard. I tossed out most of the “magical” properties and tried to make them as real as possible. I tried to look at vampires, as I do all of the entities from the Black Lands, and think, What would it be like if they actually existed? What would a bunch of scientists and doctors make of them? Black Lands vampires start with a virus. It has a long technical name, but most people in my world refer to it simply as the vampire virus, or VV. And if you think that sounds a bit like HIV, well, that’s not a coincidence. VV operates a bit like HIV, and in my world people are as afraid of getting one as they are of the other. VV is passed through the blood and is highly contagious. It attacks the immune system, then everywhere else, until it induces a coma-like state. Then it really gets down to business. After a period of gestation, usually between 24-48 hours, the virus reawakens its host as a vampire. Vampirism as a virus is not a new concept, but it was the one that felt like the best choice for my stories. The science I use is probably a bit wonky, but then I’m not Robin Cook writing medical thrillers over here. I want to make things seem real. I want readers to think, Well, I’m no medical doctor, but that sounds like it could happen. It’s Michael Crichton and frog DNA in Jurassic Park. Yes, a roomful of scientists could probably tell you why it wouldn’t work, but that’s not the point. It’s about plausibility combining with creativity to make fantasy. Going with a few simple rules allows me to tell the stories I want to tell. I’m not as interested in bloody shoot-‘em-ups as I am about the characters. I like exploring how people live in a world where the supernatural exists. They don’t really understand it, which makes them afraid of it, unwilling to deal with it, but they can’t deny it. 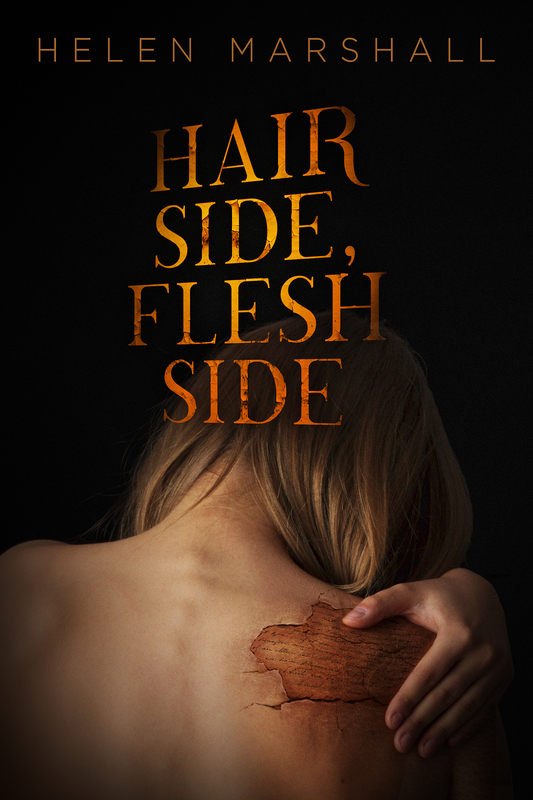 In a story I have coming out this fall, “Midnight Blonde,” Felix Renn meets a woman who has been bitten by a vampire. She comes to him because she knows if she goes to the emergency room and tells them what happened, she’ll be put into federal quarantine. Again, I tried to think what would happen in a world where the vampire virus exists. What would the authorities do to protect society against someone who was infected? I could see this poor woman locked in a room for observation — a room with a very large window to let in the sunlight, which would be the truest test to determine if she was infected. And if she wasn’t, if she turned out to be one of the lucky few who managed to avoid catching the virus? Well, she’d probably still be detained by the feds, being poked and prodded for years to come, maybe for the rest of her life. This was the story I wanted to tell in “Midnight Blonde.” What would you do if you had a death sentence hovering over your head? Who would you go to for help? What hopes would you cling to? Of course, Black Lands vampires aren’t just undead. That would make them closer to zombies (and yes, there are zombies in the Black Lands, but that’s a subject for another time). They have fangs, they crave blood, and they have above-average strength and reflexes. They’re not so strong and fast that I would call them “superhuman,” but you still wouldn’t want to meet one in a dark alley. Their strongest feature is their regenerative ability. Black Lands vampires can be injured by physical trauma, and they do feel pain, but their bodies can repair themselves almost immediately. Shooting a vamp or stabbing one with a knife may slow it down, but it won’t kill it. When it comes to killing Black Lands vampires, I again decided to stick to the common folklore. One way is sunlight. The other is a stake to the heart, cut off the head, and burn them in separate piles. Black Lands vamps don’t melt into goo or disappear in a puff of flame. Just like they don’t turn into bats or mist or summon wolves or sparkle. For the most part, I’ve tried to keep my vampires rooted in the physical world, while leaving a few things about them in the dark (so to speak). Why are they vulnerable to wood? Why must the heart be pierced if they’re already dead? Why do they need to be decapitated? Some of these things I know, and will reveal in future stories, while the rest… well, it’s the supernatural. It’s part of the fear. And that’s also part of the fun. A Review of Nancy Kilpatrick’s The Vechi Barbat in Vampyric Variations (Edge, Forthcoming October 2012). Although set in a psychiatric facility and featuring a Romanian protagonist, Nancy Kilpatrick’s short story The Vechi Barbat is fundamentally a very Canadian tale containing traditional Can Lit themes. Her story is about the struggle between tradition and modernity, the tug that the traditions of the past have on a person while they seek out the desired spaces of the future. Kilpatrick’s narrator, Nita, is a woman from a small Romanian village who has been told that her destiny is to look after the village old man, the Vechi Barbat, who is trapped in a cage, doesn’t age, and needs blood to survive. She wants to go to university and study anthropology, to move away from her village that is mostly populated by the elderly (most of the young have moved away to pursue futures elsewhere). Nita sees her village as trapped, stuck with outmoded ideas and mired in the past. She seeks to educate her village on the new ideas and thoughts she has adopted while abroad, to teach them that their mythology of the Vechi Barbat cannot possibly be true, but tradition retains its hold on her, showing her that no one can totally escape from family and their past. This is the classic Canadian theme of the desire to get away from family obligations to create a new life and the essential and irresistible draw of the past, of home, and of tradition. Like many protagonists in Can Lit, Nita finds that she can’t escape from home, but is rather torn between tradition and new ideologies – suspended in an uncontrolled present that is a tear in the timeline between future and past. Kilpatrick’s tale is set in a psychiatric institution, the perfect space for someone torn between future and past, disrupted and disturbed. Like the Vechi Barbat, she is confined, trapped, and the psychiatric hospital is strangely reminiscent of the vampire himself – cold, white, sterile, and fundamentally dead. She is controlled by medication, where he was controlled by starvation and, although she didn’t feel the bite of the vampire’s teeth themselves, she feels their bite by proxy through the needles injected into her body that erase reality in their attempts to subdue and control her mind. The psychiatric institution is a place of control, a place where tradition is denied and where the only reality that can be constructed is one of medical modernity, where the doctor desires absolute hegemony and nothing can interfere with her world. The medical profession is fundamentally about power and has no place for any power that it cannot explain. The skill of Kilpatrick’s prose in this story can be seen by her ability to alternate between the descriptive sterility of the hospital and the colourful livelihood attributed to the Romanian village that Nita comes from – the rich mythological stories full of dark gods and betrayed love and the richness of the colours of the mountains themselves (though the predominant colour is the blood red that seems to infuse every aspect of this traditional landscape). Kilpatrick’s love of intelligent, conflicted characters can be seen in the construction of Nita, a woman who is fundamentally brighter than the medical doctors and psychiatrists who seek to control and limit her. She is infused with a darkness, a burning guilt that the medical profession, with its cold logic and inability to see past its own viewpoint, cannot approach. Kilpatrick reminds her readers that an open mind is needed when approaching every issue and that limiting oneself to one’s own perspective only denies the depth and reality of a situation. While reading The Vechi Barbat, the reader can feel the white, dead walls of the institution closing in on him or her, suffocating any creativity and anything the medical profession cannot control. The reader shares in Nita’s frustrated helplessness, denied voice and power until Kilpatrick releases them at the end of her story, with a reminder that the only escape from psychiatric control may be the danse macabre with death himself. 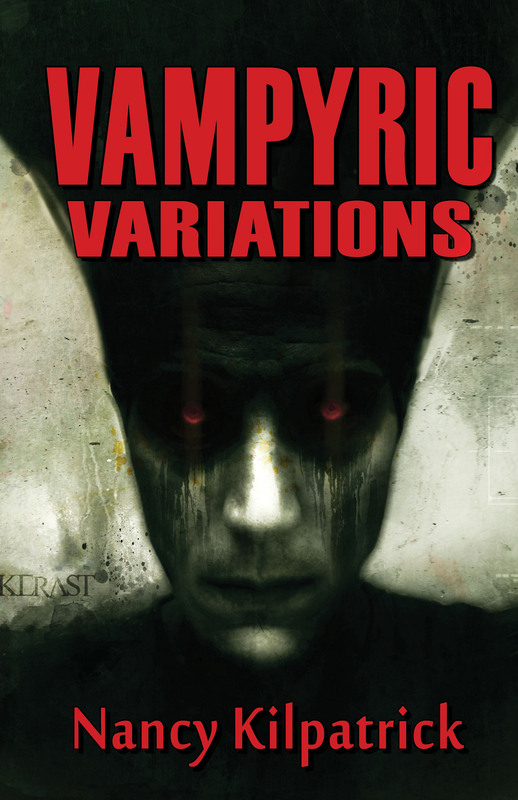 Nancy Kilpatrick’s short story collection Vampyric Variations (in which you can find The Vechi Barbat) will be released in October 2012 by Edge. To read more about it, go to http://www.edgewebsite.com/books/vampyricvariations/vv-catalog.html . To read more about Nancy Kilpatrick, explore her website at http://www.sff.net/people/nancyk/ and enjoy my interview of Ms. Kilpatrick later this week on Speculating Canada. Reap the Benefits of This New Volume on Death. 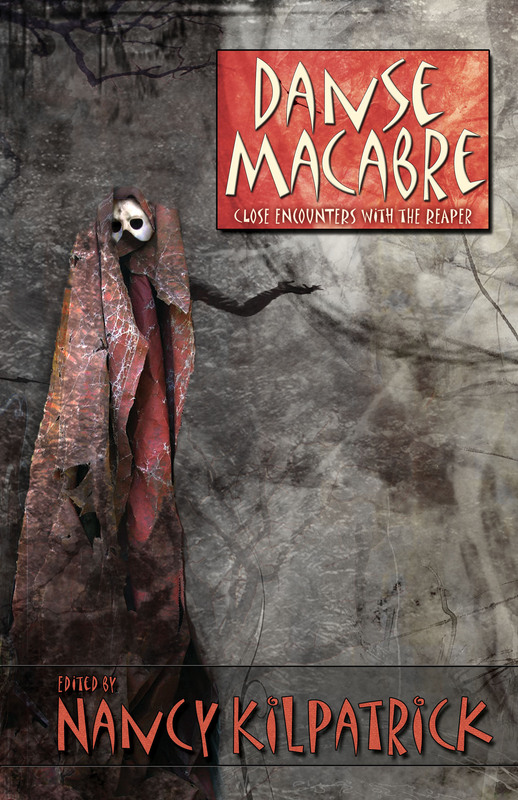 If you don’t think Halloween will give you a strong enough dose of the dark and deathly, check out Nancy Kilpatrick’s edited volume Danse Macabre: Close Encounters with the Reaper coming out in October from Edge. The stories in this collection plan to explore the human interaction with death and how that shapes us. This collection includes a wide variety of contributors who explore the role that death plays in shaping our humanity. This volume aims to delve into life’s great mystery and explore the diversity and multiplicity of the idea of death. Prepare to read in the gloomy dark.